We are at the heart of fundamental changes in the College. On the screen is a dynamic composite of the over 100 faculty we have hired in AY 2015, 2016 and 2017 under Rudy Buchheit’s leadership. As you can see, this is not your traditional engineering faculty. Almost 35% of our younger faculty (<40) are female and almost all our retirees are not! We still have much work to do to increase the racial diversity of the faculty, and under Donnie’s leadership we will redouble our efforts. At this stage, we are more than half-way through unprecedented growth in faculty and staff, with 310 tenure track and over 40 professors of practice, on our way to 340 and 60 respectively. All our hires are scholars and educators. Soon we will be beyond the legacy of an open-enrollment Ohio State, wherein many faculty spent much time winnowing out those students who could not cut it. Now well over 80% of our students cut it and graduate in under 6 years, and the great majority of our faculty are active in research. We continue to attract, retain, and graduate the smartest students in the smartest university in the smartest city in the nation. Soon we will recognize the last 1,100 of around 2,000 total graduates this past year. Next fall we will announce, yet again, the smartest freshman class in our history – all 1,640 of them. Now is a good time to note that Liyang Feng (CSE), Juan Tramontin (Fisher College, logistics), George Valcarcel (ISE) and Kai Vogeler (MAE), have been named University Innovation Fellows. While we are talking about student achievement, Ohio State engineering honors student Kyle DeBry has been named a 2018 Goldwater Scholar, the most prestigious national award for undergraduate researchers in science, math, and engineering. Ohio State University engineer Alison Walasinski (CBE) won the 2018 Cooperative Education Student Achievement Award, a national award recognizing distinguished achievement and excellence for one student who excelled in work-integrated learning through a Cooperative Education Program. She’ll be recognized at the 2018 CEIA Annual Conference in Charleston, SC. CEIA also recognized staff member Katy Arenschield for her Buckeye Engineers Work campaign. Our EcoCar team won the national championship for the third time in a row, the Buckeye Space Launch Initiative soared to first place in the 30,000 feet Spaceport America Cup 2017 in New Mexico. Our students designed, built and flew the fastest autonomous air vehicle in the world. Since that drone is still 100 mph slower than our electric Buckeye Bullet, I think there’s going to be some interesting competition between the two. I suspect – and hope! – that neither of them will go faster or higher than next year’s student rocket! Such experiential education is the hallmark of our teaching, and these are just the tip of the iceberg in terms of student achievement. We just recognized all of our outstanding staff at lunch today, and I’d like to say yet again how we cannot do it without you. Holding a Ph.D. is only one route to being an invaluable member of the College. Most of our employees do not, yet bring extraordinary skills that make us faculty members look better than we often are. I am aware that sometimes we might not send staff members that message, but please understand that the College leadership gets it. I welcome Heshem El Gamal as the incoming chair of Electrical and Computer Engineering, as Joel Johnson returns to his research in the ElectroScience Lab, and Allison MacKay who has replaced Dorota Brzezinska as chair of Civil, Environmental and Geodetic Engineering after Dorota became Associate Dean for Research. Likewise, we welcome Samir Ghadiali who replaces Rich Hart as chair of Biomedical Engineering. I’d like to call out Rich personally for his stellar role over many years in leading BME from a small new unit into a thriving, highly diverse unit managing extraordinary student demand. We are losing an extraordinary faculty leader. So if you note a downward trend in faculty hires, you are correct. The end of our 25% expansion in tenure track faculty is in sight, and the university budget changes are in turn having an ameliorating effect on our budget. Nevertheless, under Marie Mead’s leadership, the college continues to be on a sound financial footing. We have developed solid financial plans to support capital projects and the plan to grow the faculty to 340 tenure track positions over the next three years by leveraging support from the University, the Discovery Themes, and the Comprehensive Energy Management plan. We continue to face challenges with limited funding, marginal increases in tuition and static state funding. But our conservative financial approach over the last several years during significant growth in the budget will allow us to continue to meet payroll, cover AMCP and make strategic investments. However, the halcyon days of relatively liberal investing are rapidly returning to the norm of much more focused investment – which is why we have a strategic plan! You just heard from Rudy about the College’s strategic plan, and what we do henceforth will continue to be guided by that plan. All of these achievements are in place because of our past strategic plan. We are now aligned with the University’s strategic plan and will be asking all unit leaders to ensure that their own strategic plans are appropriately modified. Why do we need a strategic plan? As we move forward, the national environment for higher education is increasingly competitive. The number of 17-year olds is declining as a fraction of the total population, and federal sources of support for research are flat or declining (National Institutes of Health excepted). At the same time, engineering faculties across the country are expanding as universities seek to shore up revenue streams by investing in high value-add programs – just as is happening here. Over the past several years, we have helped ourselves in significant ways to be more competitive. We have expanded and diversified our educational and research capacities. We have invested, and continue to invest, in our physical facilities. We have invested in our faculty and staff and are creating pathways and programs for professional development. We have invested in new academic and research programs. We are well-partnered with industry and government laboratories. We have explored – with success – new staffing models that blend academic and industry talent in research centers. We are already seeing dividends in research expenditure, rankings, and an elevated value of the Buckeye Engineering brand. The local economic environment is also favorable for us. The economy in Central Ohio is healthy. Its national profile is positive and on the rise. Venture capital has appeared in Central Ohio in substantial amounts, and we are invited to compete. The innovation ecosystem is maturing, and we have standing invitations to participate there as well. Our challenge now is to engage – we are ready. We have created flexibility for ourselves and created pathways into new domains of research and education as we have expanded and diversified. These are new tools in our toolbox, and we need to take full advantage of them to be most competitive. Specifically, the words in our promotion and tenure guidelines have changed across the college to encourage the recruitment and use of all forms of funding to create impact through research and innovation. We must now live up to those words in our actions to address the challenges of competition. The words in our P&T documents express a new and deepening valuation of research productivity beyond academic scholarship. Impact through the creation of tangible products and processes, developing and securing intellectual property, and the creation of business entities. I ask that you explore these modes and engage them as opportunities present. If these pathways are not for you, I ask and expect that you be prepared to support your colleagues who choose and pursue these pathways. Collaboration has become a core value. In evaluating the performance of individuals and organization, collaboration is not a diluent. Collaborative work is strongly encouraged, and indeed is essential to most types of inquiry in which we engage. In our teaching, we must maintain commitment to experiential learning. Being an engineer is as much about what you can do as it is what you know. The workplace readiness of Buckeye engineers is being judged accordingly, and we must understand and respond to that. The new Digital Flagship project putting iPad Pros in the hands of all our first year students is an opportunity for us to yet again lead in the education of our future workforce. The strategic plan will guide future hiring philosophies. Look to focused hiring in the areas of mobility, manufacturing, materials and medicine. Look to enhanced hiring of joint appointments in the waning days of the DT investments and in the growing area of CEM. We are focused on building and sustaining a climate of inclusion. I would like to recognize and thank college leaders who to took time to increase their awareness and knowledge of cultural transformation strategies by participating in our leadership development sessions during the 2017 fall and spring 2018 semesters. They completed sessions on Inclusive Leadership, Active By-Stander Training and most recently the White Men as Full Diversity Partners Summit. I also want to acknowledge and thank (almost!) all of you for completing the two online Sexual Misconduct Training Programs. Faculty and staff completed over 2,200 trainings since January 8, 2018. I want to extend special recognition to the Ohio State Airport and Engineering Research Operations for attaining 100% completion rate. Today we have obtained a 94% completion rate across all units. Our goal remains a 100% completion rate. Recently, our commitment to our core values was challenged by individuals and groups, outside of the College, who published racist, hateful, homophobic and potentially violent remarks about one of our student organizations – the Society for Hispanic Professional Engineers (SHPE), LGBTQ colleagues, and one religious group. While we respect and understand our right to Freedom of Speech, we repudiate any and all behavior that would seek to intimidate, bully, harass, discriminate against or harm members of our community in any way. The College of Engineering is partnering with the University Office of Diversity and Inclusion to host the 24th Annual National Conference on Diversity, Race & Learning, May 7 and 8, at the Fawcett Conference Center. The keynote speaker will be Candi Castleberry-Singleton, VP of Intersectionality, and Culture & Diversity at Twitter. I believe her presentation will exceed 140 characters! We are managing the university’s highest quality students, and they are more diverse than ever. La’Tonia Stiner Jones is responsible for growing our female graduate students by 10% and underrepresented minority students by 15% – in just this past year! This year we received a total of 127 fellowship years from the Graduate School, up from 94 last year. Our diverse graduate students won 31 fellowship years – up from 22 one year ago. We are commencing yet another major infrastructure project: The Biomedical and Materials Engineering Complex (BMEC) will renovate and add new space to Koffalt-Fontana and, three years on, McQuigg and Watts. The bringing of BME onto main campus, while keeping a strong presence in the ever-growing hospital and health science campuses, opens doors for many more interactions between engineers and medical professionals. So we are simultaneously launching a strategic plan to focus the interaction between the College, the James Cancer Center, and the seven Health Science Colleges. This latter effort is led by Associate Dean for Research Dorota Brzezinska and Rich Hart, in perhaps his last leadership role in the college. The new airport terminal will open early next year, and we are planning our first corporate hangar at Don Scott Field. The Transportation Research Center will start building its new Smart Center in the next few months, and we are at the heart of the conversation on the new interdisciplinary research building. We just opened a renovated soil mechanics lab in CEGE and placed an $8.5M order for two cryo electron microscopes to enhance the CEMAS infrastructure and serve the drug discovery and molecular biology communities. Our IT infrastructure is key to our technical progress, and I want to thank Marsha Henfer in absentia and interim director Jim Giuliani for all they did to implement the core network upgrade for the College. This has had an amazing effect on connectivity speed. For example, the ElectroScience Lab went from a 1 gb/s network connection prior to the network migration to a 40 gb/s network connection today (40x increase), while the Airport went from 500 mb/s to 9gb/s (18x increase). We reduced firewalls from 19 to four, thus enhancing collaboration and data sharing across the college. We have decommissioned 12 out of 19 active directories and will further reduce this over the summer as we migrate to the new data center in the SOCC, reducing costs and outages as well as enhancing security to meet ITAR and export control expectations. What does this mean? A year ago a capstone design team from four units in the college could not sit at the same computer where everyone had an account. Now they can! ABET came and went, and in addition to the architecture accreditation we hope that by July 1 all of our 14 programs will be re-accredited – a phenomenal effort led by David Tomasko and a team of unit champions. Particular credit to agricultural engineering, BME, computer engineering and electrical engineering in ECE and MSE for passing with no identified weaknesses. Bob Mick and his team continue to grow professional and distance education, with over 250 students in our data analytics certificate program, eight other non-credit on-line and in-person programs, and top 25 rankings for MGEL and welding engineering. Commercialization of IP from our faculty, staff, and students has never been stronger – 213 first-time inventors last year – 217 so far this year! 26 patents were awarded last year and this year 28 – so far! We now have 23 active companies that have been spun out of the college – almost half the total for the university. These include companies like inMobly, founded by Hesham Elgamal, SpineDynX, founded by Bill Marras, and Core Quantum Technologies, founded by Jessica Winter. Spinouts, like these not only provide commercialization pathways for entrepreneurial-minded faculty but they contribute to economic development and job creation. So we are fulfilling our mission of “enhancing the economic competitiveness of the State of Ohio” and opening new doors for our students. Thank you Scott Osborne, Art Gooray, and Matt McNair and his staff at the Technology Commercialization Office. We are expending more money than ever on research, breaking $150M for the first time last year. My thanks to Dorota, and it’s very appropriate also to call out Randy Moses, who spent many years building the base on which Dorota, all our faculty scholars, and research staff are now breaking records. Now is good time to recognize Professor Steve Ringel, Director of IMR and the M&M Discovery Theme for receiving the university Distinguished University Professor – one of only 57 in the history of The Ohio State University! 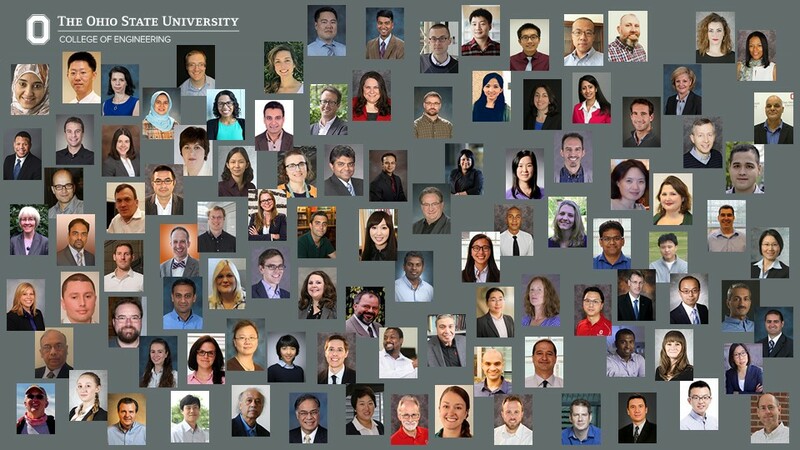 We have had 48 CAREER awards to young faculty in the last six years, and I’m delighted to add Lei Wang Assistant Professor, CEGE; Ran Dai, NetJets Assistant Professor, MAE; Jonathan Song, Assistant Professor, MAE; Yinqian Zhang, Assistant Professor, CSE; Liang Guo, Assistant Professor, ECE. Andre Palmer’s research on polymerized hemoglobins for use in transfusion medicine won $2.4M in support from the U.S. Army, building on $8.4M in NIH RO1 funding received earlier in 2017. Andre is clearly our $10M man – just amazing for a department chair! The Center for Aviation Studies' participation in the FAA Center of Excellence in General Aviation (PEGASAS), was renewed for a second 5-year term. Since 2012, the PEGASAS Center of Excellence has resulted in nearly $4M in cash and in-kind research activity for the Center for Aviation Studies, partnering CAS staff with faculty, staff, and students from CEGE, ISE and MAE. SRI will be collaborating with Boeing to investigate powered human exoskeletons and will host a visiting scholar from Boeing for six months. Cindy Roberts, Ph.D., (Professor of Ophthalmology and BME) has been named on the “Ophthalmologist 2018 Power List” that maps the Top 100 most influential people in the world of ophthalmology. Joel Johnson’s ESL team completed and delivered Ohio State's CubeRRT CubeSAT to the launch provider in preparation for its launch to the international space station, currently scheduled for May 20 from Wallops Island, Virginia. When it docks with the ISS it will be another inspiration to our student rocket team to go ever faster and higher. Center for Design and Manufacturing Excellence added the latest GE Arcam Q10+ and Concept Laser industrial-grade metal printers to its $3M additive manufacturing laboratory as part of their collaboration with Proto Precision and GE Additive. EED Faculty members have received a bevy of grants including the following: Monica Cox, Emily Dringenberg and Rachel Kajfez all received NSF grants from different divisions of NSF. Since last fall, CAR has supported $17 million in proposals, collaborating with 8 units, including ECE, MAE, SIMCenter, KSA, ARC, ESL, IMR and NTW. Approximately half of the proposals were to private sponsors, and the other half to public sponsors. LS Fan received national attention for his clean fossil fuel technology. Architecture Section Head Professor Todd Gannon’s book, Reyner Banham and the Paradoxes of High Tech was recently released by the Getty Research Institute. Associate Professor of City and Regional Planning Jesus Lara addresses issues of Latino urbanism in his new book, Latino Placemaking and Planning: Cultural Resilience and Strategies for Reurbanization, published by University of Arizona Press. Several faculty in aviation and MSE were called on to explain the issues surrounding the recent deadly failure of the Southwest Airlines jet turbine. Smart Columbus continues to involve faculty from C&RP, such as Rachel Kleit who leads a new program geared toward moving low-income, single-mom families into stable housing and neighborhoods. John Lanutti's MSE team is developing paint to allow blind people to be better aware of exactly where they are at road crossings. As already noted, 3D printing is expanding across many aspects of our research from 11 instruments at CDME printing all kind of materials and parts for GE Aviation, to Prasad Dasi manufacturing replacement heart valves and Bill Marras working on printed spine replacement parts. I already mentioned strategic faculty hiring as we continue the extraordinary growth of the college. We are restructuring our “admit to major” process to simplify our recruiting and retention for the very best students. We will push hard to ensure that the new General Education curriculum is focused on the needs – technical, fiscal, ethical and digital – of students in the 2020s rather than the 1980s. We will expand our counseling service to address the ongoing mental health needs of our student body. We will continue to evolve the college’s P&T criteria reflecting the significant number of Discovery Theme hires that are in our ranks. Their commitment to, and our expectation of, meaningful collaboration outside their TIU is not always appreciated within the TIU. Each DT hire receives only 25% of their salary from the TIU so I interpret this as implying that the TIU has a similar say in how the DT faculty are evaluated. As already noted, the P&T criteria by which faculty of my vintage were evaluated are not the criteria by which we should still be evaluating our new colleagues. We will focus on growing new industry partnerships to ensure we grow into the #1 college in the nation in terms of industry funded research – currently we are #3. Our role in helping to attract major companies to central Ohio is well known at the university level and within the Columbus community. In particular the $70M Ohio State, State of Ohio, College investment in TRC’s Smart Mobility Center will be a major opportunity for new industry attraction, as will the airport and west campus. We will play a pivotal role in Comprehensive Energy Management and the plans for the new energy innovation center on west campus. We will roll out the first ever engineering technology 4-year degree program at some of our regional campuses. This is our contribution to Ohio’s workforce development needs, bringing employment opportunities to those rural regions of our state devastated by the opioid epidemic. We will raise enough external funding to complete the airport and move ahead with BMEC phase 2 (Watts and McQuigg). In the current fiscal year, the College has held more than 35 alumni engagement events with another 10 planned before June 30. Our aim is to ensure that we directly reach as many of our 62,000 alumni as possible, providing updates on the College – its students, faculty, and research, as well as opportunities for alumni networking. Over a three-year period we have more than doubled the number of outreach efforts to alumni with a targeted focus on key metro areas. All of this is part of the quiet phase of the next campaign which will kick off in 2020, the sesquicentennial anniversary for Ohio State when we aim to significantly improve on the last campaign’s total of $399M. Chris Yates’ team is yet again raising more money than any other academic unit on campus, and we expect that to continue. Lastly, let me end by showing you another infrastructure project. This is the Novartis campus in Basel. The Square and the Pavilion were designed by Professors Cruse and Imbert from the Knowlton School of Architecture. The project seamlessly merges architectural and landscape interventions to create a new type of workspace for Novartis employees. So here is Ohio State showing its design strengths at the heart of a major international company in the heart to of Europe. Now that’s what I call impact! In conclusion, let me note that our future is amazingly bright. This is all happening because of the work that all of you – our faculty and staff – have done to recruit, retain, educate, and graduate the university's finest, increasingly diverse, and most highly qualified student body. Even as we hire so many faculty, we still have the highest undergraduate student/tenure track faculty member ratio in the Big 10. And yet, you manage this extraordinary challenge without complaint, you knuckle down and handle the issue in true engineering fashion. Much of that is changing as you can see from the first slide I showed. Thank you for all the support you have given me and the college leadership team. It is my honor to lead such an amazing group of individuals. On November 28, 2017, students, faculty and staff in our college were at the center of an unprecedented tragedy on campus, when a disturbed individual drove a car and wielded a machete at a group of people who were predominantly from Engineering. Several of the group were injured before the attacker was shot dead, which occurred in view of many individuals in our college. I would like to thank the first responders, especially officer Alan Horujko for his bravery and swift decision-making. I would also like to acknowledge our college leadership team, especially HR, student affairs and many of the support groups that came together to assist those who suffered, physically, mentally and emotionally from this tragic affair. We understand that events like these can be transformative for individuals and trust that those of you who were affected and those who continue to feel the effects know that those resources are still at your disposal. We do not let terrible events like this define us, but rather we are defined by how we respond and rise to the challenge. We celebrate the resilience of our faculty, staff and students and their ability to rebound, pick themselves up and continue to move the college forward. As my seventh year as dean begins, we are at a pivotal moment in our college’s history. We have experienced unprecedented growth in faculty and staff, and we are managing unprecedented numbers of ever-higher quality and more diverse students. We’re expending more money than ever on research and raising more funds than any other academic unit on campus. For these accomplishments and for all that everyone in the college does to make us so successful, I thank you. I’d like to open my address by putting all of this growth in the context of the college’s infrastructure. As you all know, space is the final frontier… the resource that we never have enough of and yet the one to which we cling when all sensible usage of that space stopped years ago. So space is indeed a paradox. The college has added 57,000 square feet of assignable space this year, and we are responsible for (i.e., we pay for) 1.1 million square feet overall. Let me remind you what has happened over the last five or so years in terms of new construction and renovation: the Chemical and Biomolecular Engineering and Chemistry (CBEC) Building, the Center for Electron Microscopy and Analysis (CEMAS), our ElectroScience Laboratory, the façade work on Bolz Hall, our improvements in Information Technology offices, the Center for Design and Manufacturing Excellence (CDME) and the Spine Research Institute (SRI). Let me also share with you what is underway at present, including enhancements at The Ohio State University: the first phase of development at the Transportation Research Center (TRC), planning for the Materials Corridor I (Koffolt and Fontana Halls) and the ongoing work at Pomerene Hall as the permanent home for Data Analytics. I’d also like to add what is in the pipeline: Materials Corridor II (McQuigg and Watts Halls), hangar/industry partnerships land leases at the university airport, the second phase of improvements at TRC and planning for Bevis Hall, BRT II, Framework 2.0 interdisciplinary Research Building, Energy Research Center, and the 4th floor of Baker Systems Engineering. I would encourage you to see new space as an opportunity to go where the investment is. The time for individual units to occupy one building is long gone. Several of our units are already in two or more zip codes. Let me state that if you feel your space is inadequate in some way, find ways to partner with colleagues in those areas which are growing. Such an extraordinary set of infrastructure projects requires that we work differently to stay on top of the multiple challenges. Historically, space has been under the aegis of the Associate Dean for Academic Affairs and Administration. That combined title and responsibility made sense when we were hiring a few faculty each year and building or renovating one or two smaller areas of the college. This arrangement no longer makes sense when we are hiring dozens of faculty and building or rebuilding multiple facilities. We have brought on Professor Mike Hagenberger, a construction engineer out of Civil, Environmental and Geodetic Engineering, as Assistant Dean for Facilities Planning and Management. Mike will bring academic input and construction knowledge to help our facilities coordinator Mark Scott. In the future, the Associate Dean will concentrate on Academic Affairs: faculty hiring, retention, tenure and promotion. Let me continue on this theme of personnel and leadership. Following in a long line of college leaders who have moved up within the university and elsewhere, I would note the recent appointment of former Associate Dean Jennifer Evans Cowley to be the Provost at the University of North Texas, the recent appointment of Professor John Volakis as Dean of the College of Engineering at Florida International University and the promotion of Associate Dean for Research Randy Moses to Senior Associate Vice President for Research here at Ohio State. We are actively seeking a new ADR, and I hope to announce that decision shortly. I also note the appointment of Professor Farhang Pourboghrat as Chair of Integrated Systems Engineering, and I thank outgoing Chair Phil Smith for transforming that unit from a group of factions to an integrated department. I wish Phil all the best in his retirement. Biomedical Engineering Professor Rich Hart, the éminence grise among our chairs, has indicated he wishes to step down at the end of the next academic year, and we are well on the way to appointing a replacement chair for Rich, who almost single-handedly led the growth of BME from a small department to one in excess of 20 faculty with a growing student body and academic reputation. Mike Cadwell has agreed to continue to lead Knowlton School of Architecture for another four years. Xiaodong Zhang will be stepping down as leader of Computer Science and Engineering at the end of next academic year, and we are just starting the process of seeking a replacement. So, as always, time and change will surely show…..
We have 51 faculty searches underway or completed this academic year. This is a number worth repeating! Of course this is going to be a cake walk after the 60 searches we had last year…! If the searches produce the expected number (~30) of new faculty, we will have hired over 100 new professors in the last three recruiting cycles. Our college is slowly becoming a 21st century organization, and we have to ensure that our operation, our organization and our processes are similarly 21st century. Tenure-track faculty will be younger, more diverse and well over 300, on track to 340. Coupled with ongoing growth in research and clinical faculty, our professorial ranks will soon be well over 350, with 400 in sight over the next couple of years. Hats off to Rudy Buchheit, all of our unit leaders, search committee members, new faculty mentors, business managers and the college staff (in particular Laura Cotton and Patti Chrisenberry), who are responsible for the smooth operations behind all the superficial chaos of such an extraordinary effort. As I just mentioned, our internal processes should be 21st century, and at the last faculty meeting we approved unanimously a new Pattern of Administration. The new PoA seriously re-organizes the responsibilities of the college administration in terms of assigning professional business leadership to manage budgets and fiscal matters, professional HR leaders to handle the plethora of issues always present when such a large group of human beings interact. Today, Rudy will present to you an updated set of Promotion & Tenure criteria that will continue to change the expectations that we place on our faculty to be leaders now and in the future. In past years we have taken the lead in the university in emphasizing the appropriate role of invention disclosures, patents and licensing revenue and research funding from sources beyond the traditional federal agencies. Today we acknowledge that research and scholarship is a much more collegiate endeavor, and the old views of the primacy of the single-author papers and single-PI grants are long gone. Henceforth, we will encourage and reward team efforts, multi-author papers and multi-author research proposals and grants as we have historically done with single-author efforts. These changes were unanimously approved by all of the unit leaders in last week’s College Executive Committee meeting, and I ask that the college faculty approve those changes after this address and then modify their own P&T documents to reflect the century in which we live. Just recently, 26 of our faculty earned promotion – congratulations, this is a record! Half of our assistant professor candidates for promotion and tenure were elevated before the mandatory deadline of year six. We will continue to focus on our rising stars and commit to them at the appropriate time in their career, rather than waiting for the six years to pass, just because that was the norm in the 20th century. I would like to thank all of our unit leaders, the P&T committees in the units and in the college, along with Sherri Nash on the college staff. It is you as much as the candidates who are responsible for this record class of promotions. We are getting ready for ABET accreditation in the fall, and David Tomasko and his team are on top of this. Architecture and Landscape Architecture breezed through their respective accreditation visits this past year, with high commendations from their visiting accreditation teams. I’d like to call out Landscape Architecture, which was the #2 ranked undergraduate program in the country according to the recent Design Intelligence survey of deans, which highlighted its “faculty focus on design, critical thinking, and leadership.” There’s a challenge for all the other units as we continue to plan for ABET and for our revised strategic plans! I should note that our strategic plan ensures that this faculty growth is not spread uniformly across the college but focuses more narrowly on areas that align with the college strengths, the university’s strategic plan and the economic development priorities of the State of Ohio. The last 70 faculty we have hired have been in the general areas of energy and sustainability, materials and manufacturing, mobility and transportation (on the ground, in the air and in outer space). Crossing all these areas are investments in sensing systems and data generation and analysis. Of these 70 recent faculty hires, 46% are women and diverse men. While that is progress on a local scale, the predominance of male faculty in our ranks is such that the percentage of women faculty increased only from 20.1% in 2015 to 21.1% in 2016. That’s right, we hired 46% women last year and the total percentage increase by only ~1%. More than half our units have 20% or fewer women faculty. So we must continue to redouble our efforts so that our faculty reflects our student body (almost 24% women across the college), building of course up to the almost 50% women at Ohio State as a whole. The situation is even more parlous in terms of racial/ethnic diversity, and while we have increased the number of African-American and Hispanic candidates among our faculty and staff, translating interviews into hires continues to be a challenge. Donnie Perkins and his staff, partnering with college leadership, have done a great job in raising awareness of diversity, illustrated most powerfully by our highlighting the movie and novel Hidden Figures regarding the role of African-American women as computers for NASA. All of our many search committee members have learned to recognize the challenges of implicit bias. It is time for that learning to be translated into action, delivering an even more diverse class of faculty in coming years. We will continue to expect our white male leadership to take on the role as allies and advocates for diversity, and I applaud Lisa Abrams for her introduction of this concept to white male leaders among our students. We have to address this issue both from the current generation of white male leaders and future generations of white male leaders. Just remember, as white men faculty the current lack of diversity is not necessarily our fault, but it is our responsibility to change it! Our research continues to grow. John Bair received $6.8 million to manage the Manufacturing Extension Partnership out of CDME. Mike Benzakein received $10 million from NASA for a five-year consortium supporting next generation electric motors, building on a $2 million Federal Research Network grant from the State of Ohio. Monica Cox brought in a $1 million NSF grant for her work regarding women tenure-track faculty experiences in engineering. Gerry Frankel and the Fontana Corrosion Center received $10 million from the Department of Energy for an Energy Frontier Research Center, and Giorgio Rizzoni grew the Ford Alliance program to $2 million annually. Overall research expenditures are up over 7% to $130 million. Note that the preponderance of materials, manufacturing and mobility in those research funds, reflecting our commitment to faculty and facilities in these areas. Other research announcements of note: Bill Marras (ISE) and Len Brillson (ECE) won University Distinguished Scholar awards; Yuan Zhang (ECE) and Jacob Mendlovic won faculty and student innovator of the year awards, respectively; KSA Professor Rob Livesey was selected for a second year as one of Design Intelligence’s “30 Most Admired Educators.” KSA Professor Kay Bea Jones has been recognized as a 2017 OSU Glass Breaker as part of President Drake’s 2020 Vision for Diversity and Inclusion. Umit Ozkan became the first woman to win the American Chemical Society’s Storch Award. Yuejie Chi (ECE), Nicholas Brunelli (CE), Boeing Chief Technology Officer Greg Hyslop and NASA Glenn Director Janet Kavandi gave college distinguished lectures. CEMAS became a College Center, and ESL will follow as we seek a new director. The university announced a $50 million energy research center as part of the Engie-Axium Comprehensive Energy Management Program; we will play a major role in this! Our undergraduates continue to grow in quantity and quality, and the commitment to this is showing in the number and quality of engineering and architecture degrees. We will award over 1,800 this year – a record - and almost 740 graduate degrees, tying our record last year for graduate degrees. In total, over 2,500 Engineering and architecture degrees will be awarded this academic year. Seven of theses engineers will graduate with a global option – our largest group so far. Our student body continues to diversify; under-represented minority enrollment increased by 7.3%, and female engineers increased from 22% to almost 24%. Slow progress but at least it remains positive. We continue to find new ways to open doors for our students, from the OHI/O Hackathon led by Arnab Nandi and others involving close to 800 students, faculty and staff, through to the “Buckeye Trek,” where Amy Thaci led six of our students to visit eight startups in the San Francisco Bay area, hosted by alumnus Mike Morrell. At least two of those students nailed job offers within a couple of weeks! We will continue to find ways to educate our students about job opportunities, both within and outside Ohio. Our graduate student applications increased last fall, including a 9% and 24% increase in female and URM applications, respectively. Thank you La’Tonia Stiner-Jones for leading this effort. We are, however, monitoring closely a significant (>10%) decrease in international applications. La’Tonia, together with Marcello Canova (MAE), is on a university team addressing post doc and GA compensation to ensure we remain competitive. Sadly, four of our students were taken from us prematurely, a terrible number to have to report. We recognize the lives of Yuzhen Liu (CSE), Adam Doleh (CBE), Cody Sweitzer (MSE) and Almamy Coumbassa (ECE). I thank everyone in those units and in the college office for all they did to comfort the family and friends of those students. As the technical college on campus, we should lead in all matters technical. IT is one area where we have been wanting. Now, thanks to Marsha Henfer's skills, we have a reconstructed IT operation, a cloud-based help desk, a significantly reduced number of servers, seriously enhanced security, plans to lay fiber to the airport and also to upgrade connectivity and technical services at TRC, as part of central Ohio's Smart Corridor for autonomous vehicles along Route 33, and much more! Thank you Marsha and the team. We are on track to create a single 40GB network and single active directory log in for the college. We continue to shut down independent networks and thus improve security. Our centralized service system has responded to almost 10,000 requests in less than a year, more efficiently and more rapidly than before. Our primary data center is in the State of Ohio Computer Center, compliant with NIST 800-171 security. Now, all our data is more secure and will be easier to access, not susceptible to slowing down due to overload of our own server capacity. Because of the improvement in IT, our online education and professional program development continues to grow Under Bob Mick’s leadership, our Master of Global Engineering Leadership (MGEL) and Welding MS degrees rose to 18th on the US News & World Report ranking of online degrees. We have a new data analytics online certificate program with over 100 students registered. Let me recognize Debbie Schroeder and her advancement team and their successful completion of the university’s But for Ohio State Campaign, reaching $399 million and well above our goal of $350 million. We are the single most successful fundraising college of all the university’s academic units. Our success allowed us to recruit Chris Yates from the London School of Economics via USC, Caltech and Stanford. Under his leadership we are still ahead of last year's record fundraising level, and on track to exceed our goal of $50 million this academic year. We will invest in more development, communications and alumni staff to reach our goal of doubling the average annual fundraising to $100 million. We will focus on fundraising for the new Materials Corridor (phases 1 & 2) and the Austin E. Knowlton Terminal and Flight Education Center at The Ohio State University Airport. All the achievements I’ve just recited, and indeed everything we do, is only possible because we have a sound fiscal operation with a financial bottom line that is always in the black at the end of each year. Our annual budget is now close to $240 million, which means we spend over $900,000 every working day. Under Marie Mead's direction, the college, the university and the Board of Trustees have identified financial strategies to ensure continuing growth of the engineering faculty over the next five years. We are doing this in order to reduce the high student/faculty ratio. While we increased our number of faculty significantly, the large undergraduate first-year class meant that our student/faculty ration was not reduced. The university is well aware of this and will continue to support our faculty and staff growth as we seek to manage our undergraduate numbers. In all cases, unit strategic plans that commit to joint appointments, both across engineering units and across colleges, will be encouraged. Units with strong records of attracting and retaining diverse faculty will likewise see the opportunity to continue such growth. A specific goal for diverse cross-unit and cross-college appointments will be part of the strategic plan, which is currently on hold at the college level as the university completes its plan. As the number of tenured and tenure-track faculty increase, the expectations of increased research expenditures will grow. Setting and meeting goals for research expenditures and PhD students per faculty member will be integrated into the new strategic plans of both the college and individual units. Faculty growth will not be limited to tenure/tenure-track appointments. We will grow the clinical/professor-of-practice ranks to the maximum permissible. Research professors and project managers will become integral members of all the college’s leading research centers and institutes, especially those benefiting from the Discovery Themes. I want to stress that we faculty can only achieve our full potential working with staff who bring talents that we do not have. A coordinated increase in staff will accompany any faculty increase. So the next five years should see an unprecedented investment in the college. This opportunity has come because of the commitment of all our faculty and staff to manage the huge enrollment increases. I thank you and the leadership of all our units. President Drake and Provost McPheron have recognized that we continue to provide the most accessible and affordable engineering education in the Big Ten, even as the excellence of our students has grown to compete with the very best in the Big Ten. Last year, I was able to announce at this address that Columbus was selected as one of only seven communities out of 78 applicants to be a finalist in the Department of Transportation’s $50 million Smart City competition. As you now know, we won, and the matching funds to that $50 million now exceed $300 million. 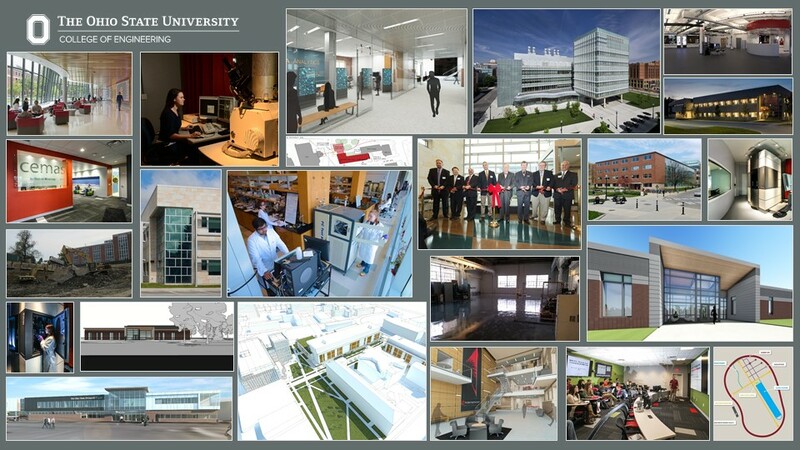 Carla Bailo and her team continue to ensure Ohio State and Engineering are front and center in this project, with over 60 of our faculty involved. We won Smart Columbus because of the presence of TRC, and as you will have heard, the university, the state and the college recently announced a combined $69 million investment in new facilities there. Currently, four faculty and their graduate students are engaged at TRC in vehicle systems and biomechanics. In just a few months, two additional faculty and their students will begin utilizing the new facilities at TRC, including cybersecurity interests and connected and autonomous vehicle research. This will be enhanced by serious broadband connectivity to permit faculty to teach from there and for students to take their classes out there. Total investment so far is $77 million, with $20 million from the State of Ohio and $49 million from the university and the college committed over the next five years. In addition, federal, state and local agencies have combined to invest $12 million in converting Route 33 to a smart corridor enabling complete vehicle-to-vehicle and vehicle-to-infrastructure communication – an essential part of an autonomous mobility plan. TRC is responsible for over 30% of the college’s annual research expenditures. Its success will drive our research success – which is why we have decided to commit so much to its success and why we will continue to grow our presence at TRC and our partnerships with Honda. Stay tuned for even larger investments in TRC to be announced in the near future. Let me note that our future is amazingly bright. This is happening because of the work that all of you – our faculty and staff – have done to recruit, retain, educate and graduate the university's finest and most highly-qualified student body. And you have done it without it complaint, you have knuckled down and managed our unprecedented growth in true engineering fashion, even as we operated without concomitant increases in space and faculty support. All of that is changing as you can see from the slides behind me. These slides will look different the next time we talk, and I look forward to even more amazing thing to happen this coming year. Thank you for all the support you have given me and the college leadership team.